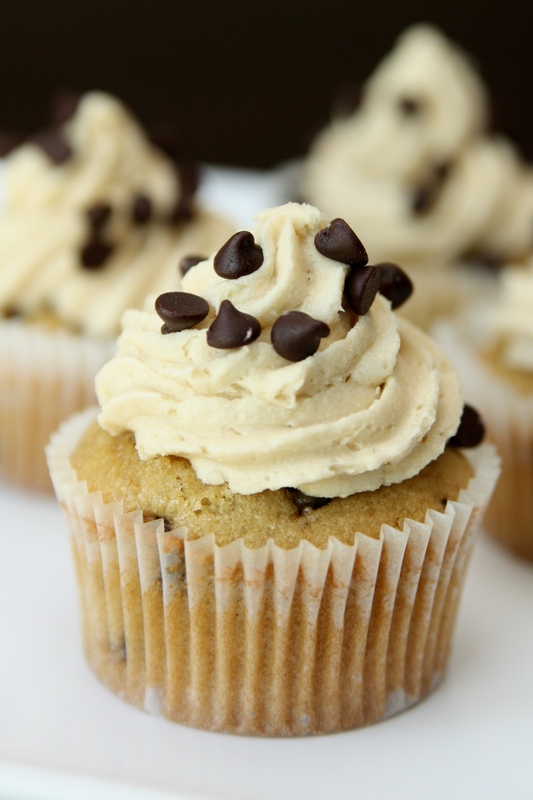 These cupcakes truly taste like cookie dough! The cake is a chocolate chip cookie dough, with chocolate cookie dough filling and topped off with a brown sugar frosting. I made these last week for my sister in law’s party…she loves chocolate chip cookies. This has to be one of my top five favorite cupcakes. Matt is a huge fan too…perhaps even more than me. This particular recipe is on several blogs, but I found it at Ucreate Foods. If you decide to make these I promise you will not regret it! Alternating add the dry ingredients to the mixer bowl with the milk on low speed, beginning and ending with the dry ingredients, mixing each addition just until incorporated. Blend in the vanilla. Fold in the chocolate chips with a spatula. Cream butter and sugar in a mixing bowl on medium-high speed until light and fluffy(approx2 minutes). Add flour, sweetened condensed milk and vanilla and beat until smooth.Stir in the chocolate chips. Store in refigerator until cupcakes have cooled. Beat butter and brown sugar with the paddle attachment on high speed until creamy and fluffy.Mix in the confectioners’ sugar until smooth. Beat in the flour and salt. Mix in the milk and vanilla extract until smooth and combined. Frost cupcakes using a pastry bag and 1M tip. Decorate with mini chocolate chips and a mini cookie. Oh my… the cake and the icing both call for 3 sticks of butter!!!!! I think I just gained five pounds reading the recipe!!! They do look awfully yummy! I think I will have to try these sometime!